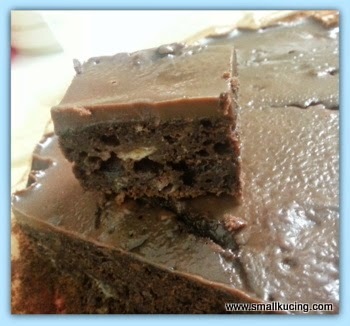 Sometime ago, Mamarazzi saw Phong Hong blog about Chocolate Banana Cake. Looks simple enough leh. Self raising flour, Banana, Cocoa powder, sugar, milk , oil and vanilla essence. All also have leh. 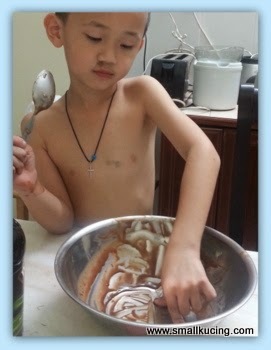 So guai guai follow the recipe lor....And I get to lick the bowl. Aiks...but mana tau after the cake come out from the oven, the top was like volcano leh. Oven too hot. Guess no two oven is the same . 160C in Phong Hong's oven doesn't means the same in ours. Guess ours need mor trial and error to get the correct heat. Mamarazzi tried to cover it with Chocolate Ganache. Hmm.....errrr.... close one eye dei. After cut ... a bit presentable la. Sprinkle some colorful sprinkles on top....bring to Funland Class and let my friends eat. Taste ah.... still needs a lot of practise la. Maybe the oven too hot, so it was not that moist. Well, it was a good attempt. For proper recipe and method, you had better hop over to Phong Hong's Blog. wow, it looks so tempting! 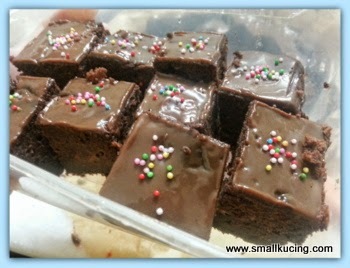 Small Kucing is so lucky to have a mummy who loves to bake..
Wow! Kathy, you are baking these days? Nice one to start off, Yep, its the oven because I learned it the hard way too. But sure the caramel over covered the cracks. Looks are not as important to me as how it tastes! But I think it IS pretty! I would like to taste and decide myself, with these ingredients it cannot be bad! At least she can bake cakes. Been wanting to try, day after day, never got down to it. Very good attempt indeed. A successful one. Wah, long time no baking post.. I like.. The last baking post I saw if I could remember was the glass-stained cookies.. Ngam mou ahh? 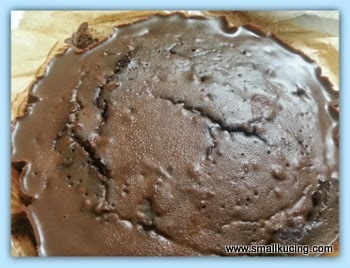 Wah, I like this chocolate banana cake..
Eh, ok ma.. After covered with ganache, looks nice wor.. It looks like agar-agar leh, how come the ganache so firm geh? But after sprinkled with those colorful polka dots ahh, look very cute ma.. Kids sure like.. So habis or not? Ah...finally I see it! Don't worry, practice makes perfect. Still it looks good with the colourful sprinkles! Chocolate my favourite, no poslaju, wink wink, lol..
Wah ... lucky kucing . It looks yummy. Chocolate cake - most children will like this cake. Small kucing is so kind to lick clean the bowl - easy to wash after that. Btw, why is it called volcano? Coz of the molten chocolate ganache topping? Agree practice makes perfect- more so if bake with love.. Enjoy your weekend. Everyone is busy lately... but I kenot miss this post... my fav thing to see is baking post... yum yum! wahhhhhh look already manyak sedap la! Looks ok wert!! I bet it's good, me love anything chocolate! wah, chocolate chocolate chocolate!! look at Small Kucing, so sedap until he also wanted to lick the bowl of dough clean!! hahahaha.. must be drooling there when watching Mamarazzi baking the chocolate banana cake.. Practice make perfect! Seems sedap bah! I made a volcano cake before and it was delish.